CUBA, an astonishing cocktail of joy of life, kindness and sweet intoxicating aromas offered to you with open heart. An initiatory journey of the Cuban cigar "puro habano" whether you are a novice or an aficionado in quest to perfect your knowledge of cigars. At the end of your stay, you will leave this wonderful island of the Caribbean, your head full of pictures and with many new friends you will long to see again. Reception on arrival at the airport. Transfer to the « Conde de Villanueva » hotel* in the Old Havana, where you will have the chance to settle in before dining. 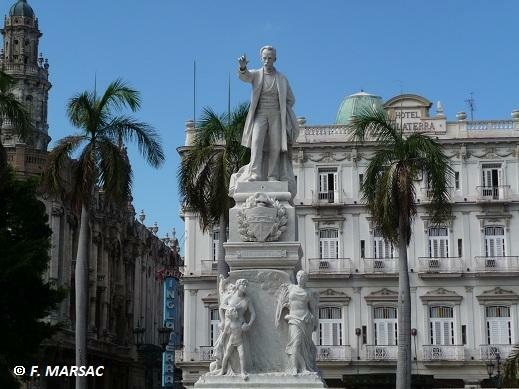 Visit the old city, a walking tour of the old colonial squares. Tasting a Mojito with a Cuban cigar at the "Conde de Villanueva" Hotel (meal on site). Meeting the famous torcedor (cigar roller) of the hotel who will present the treasures of his cigar store and give a cigar-making demonstration. City tour in old American car. Visit the military fortresses and "La Triada" cigar shop where the longest cigar of the world is on display. 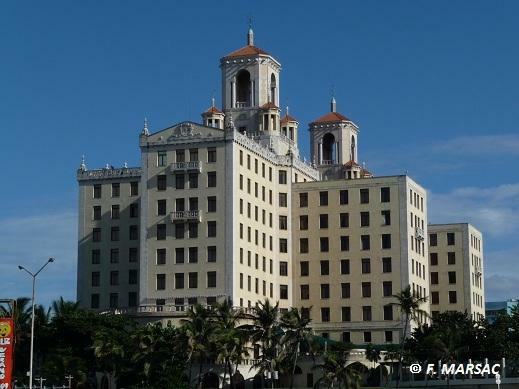 In the evening, dinner followed by a tasting of old Cuban rum with a puro habano on the roof terrace of "Ambos Mundos" hotel, where the famous writer Ernest Hemingway lived for 10 years. On the way, visit the community of "Las Terrazas" where you can enjoy the coffee plantations. Tasting a coffee in the bar of « Maria ». 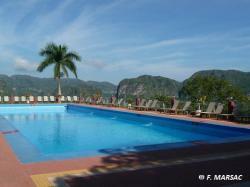 Move to Pinar del Rio. Descent into the Vuelta Abajo area. In the heart of the most beautiful plantations in the world, you will learn the essential steps in the production of the best cigars. Visit the most famous tobacco farmland, home of the renowned late Alejandro Robaina. Hiroshi Robaina, grandson of Alejandro, will welcome you around a good meal and you will spend a memorable time of life. Way to Vinales. Accommodation and dinner at the « Los Jazmines » hotel*, with its unrestricted views on the valley and its "mogotes" (the valley is classified as a Unesco world heritage site) – possibility of eating with a local family (arranged on demand). Visit Vinales by night with its Latin music festivities. 2 to 3 hour tour in the valley on foot. Visit a little farm to see the tobacco plantation and tobacco barn (depending on the season). 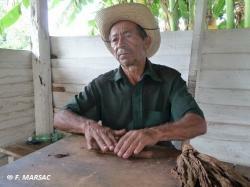 The farmer rolls his cigars himself in an artisanal way (opportunity to share time and discuss with him). Tasting his coffee and his cigar (called « la fuma »), with the farmer. Lunch at the « wall of prehistory » restaurant. 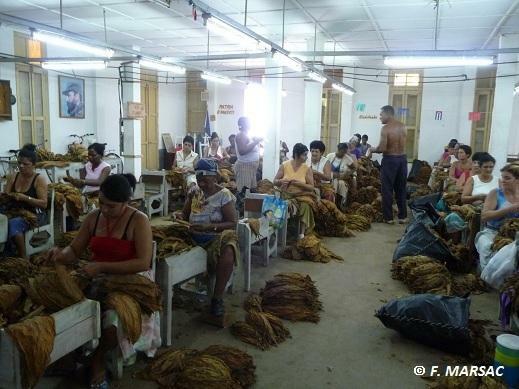 Visit a warehouse where tobacco leaves are selected, and you will learn the fermentation process. 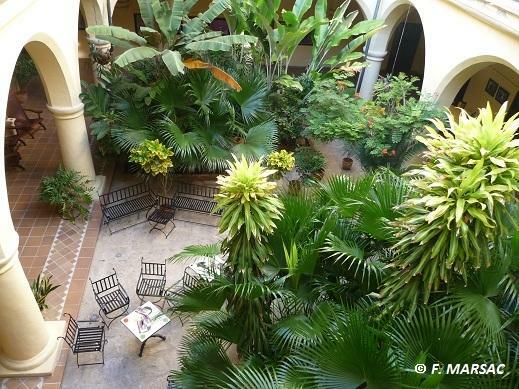 Visit the garden of « Caridad ». In the evening, dinner at « Casa del Veguero » restaurant, with tasting old rum and house cigar. On the way, visit the orchid garden where you can admire thousands of exotic varieties of plants, trees and flowers. Lunch at the « casa del habano » restaurant of Miramar, followed by a tasting of Habano. According to his availability, you will have the opportunity to spend a pleasant time with Carlos Robaina. Staying at the famous « Nacional Hotel »*. Optional request : an evening at the « Tropicana » nightspot cabaret, or cabaret inside the hotel (« Le Parisien » cabaret). On the way, visit the Cienfuegos town. Walking along the boulevard, visit the Central square and the Terry theatre. Lunch at the « Club Cienfuegos » restaurant along the bay. Continuation of the road to Trinidad. 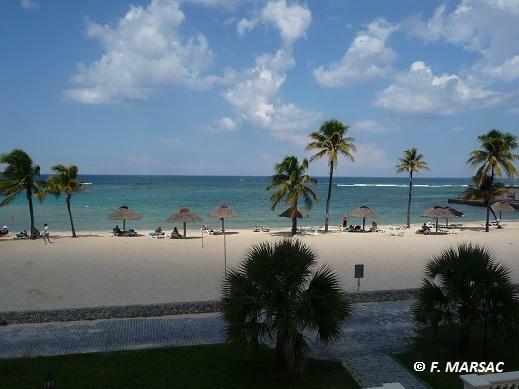 Settle in the « Trinidad del Mar »* hotel on the edge of the beach in All Inclusive (opportunity to also reside in a nice private home, on request). Enjoying a cigar in the evening. Spending the day in Trinidad to discover this wonderful town, world heritage site. Visit the potter of the town. Visit the Romantic Museum (Palacio Brunet), and the Iznaga tower. Free time in the afternoon to enjoy the beach. After the dinner, visit the town by night to enjoy Cuban music festivities in nice locations. On the way, visit the Santa Clara town and the mausoleum of Che Guevara. Lunch at « Fiesta Campesina » restaurant in a farm where you can admire animals of the area. Reaching Habana in the afternoon. Tasting the best « daïquiri » of Cuba with a Habano at the « El Floridita » bar, under the benevolent gaze from bust of Ernest Hemingway. Staying at « Nacional Hotel »*. 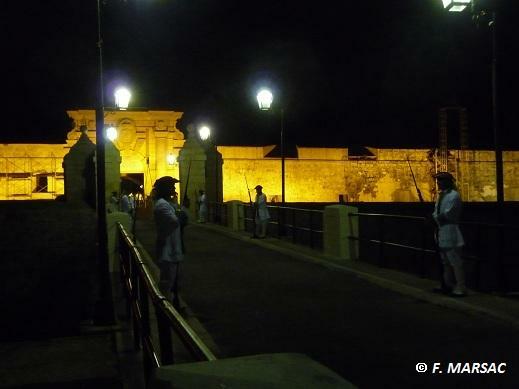 Dinner and night tour of « San Carlos de la Cabana » fortress, with the historic ceremony of cannon shot. Free day at the « Club Habana » situated in the diplomatic quarter of Miramar. You can enjoy its magnificent beach, its pools, its restaurant, and its « casa del habano » (drinks and ciagrs at own expense). Return to the hotel to dine. Visit a cigar manufactory of your choice. Possibility to make arrangements for the last day, and transfer to the airport. 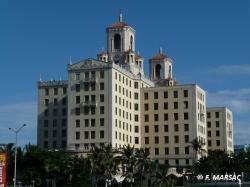 « Nacional Hotel » (*****) in « El Vedado » quarter of Havana, or equivalent (3 nights). « Trinidad del Mar » (****) at Trinidad, or equivalent (2 nights).